Branson’s Gift of Light is a fascinating Christmas attraction in Branson that is sure to light up your holiday season. This Christmas attraction in Branson will return for the 2016 Christmas Season, starting on November 1 which is open from dusk until 11 p.m. and will continue nightly through January 1. There will be many more Christmas lights displays to be added this year. In fact, 25% of the displays are custom-made new scenes and are bigger, better, and brighter. During this wonderful event, you can look for some of your favorite displays, such as Noah and the Ark, 12 Days of Christmas, and the Christmas Tree Forest. Branson’s Gift of Lights feature a stunning and breathtaking display of Christmas lights which is the highlight of the holiday season. This self-guided driving tour provides visitors an amazing way to see some of the holiday spirit that lives within the mountains and hills of the Ozarks. This holiday event which features the most fascinating display of Christmas lights will create memories that you will cherish forever. 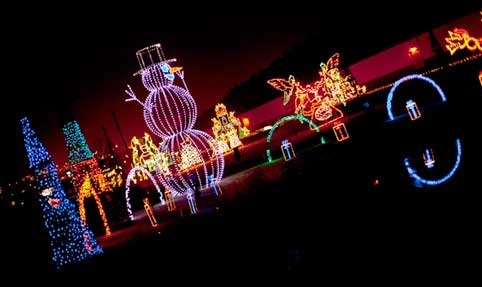 Don’t miss the opportunity to see a variety of different lit up displays this holiday season. This 1.2 mile festival of Christmas lights located near the Shepherd of the Hills Expressway have been enjoyed by residents and visitors alike in Branson for more than a decade. This year 2016, this Christmas attraction will open with a brand new display of super LED Christmas lights, which is called Branson’s Gift of Light. Enjoy the delightful Christmas lights as they should be, bright, colorful, and fun. Don’t miss to see Santa and his elves. Share the fun and the joy that you’ll feel with friends and family, the real Christmas story, as you travel back in time 2000 years to a manger in Bethlehem. This Christmas attraction in Branson is the area’s newest drive-through Festival of Lights. The all-new all-LED drive-thru Christmas light display is located in the very same location where Branson has enjoyed Christmas lights for years. Branson’s Gift of Lights has partnered with Christian Action Ministries (CAM) to help fight hunger in Branson and Taney County, Missouri. Christian Action Ministries distribute tens of thousands of pounds of food and grocery items to hungry and needy people in the community. This year, Branson’s Gift of Lights will collect non-perishable food items to be donated to CAM. The donation of these non-perishable food items is made possible by companies in the food and grocery industry and individuals who regularly donate surplus and grocery items to CAM so they can help those families who need it most. CAM have provided 625,000 lbs of food to families last year. If you wish to donate, you can bring them to the ticket booth at Branson’s Gift of Lights, from dusk to 11 pm, from November 1 through January 1. So, if you want to see the all-new all-LED drive-thru Christmas light displays this holiday season, visit the Branson’s Gift of Light in Missouri.